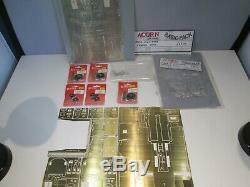 Acorn Models 7mm O Gauge 82xxx (3MT) Tank Locomotive Brass Kit pls read. Incomplete - very much a case of what you see is what you get so please view photos carefully and I will do my best to answer any questions. 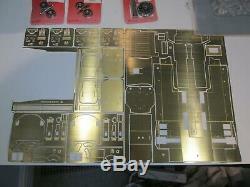 Includes Nickel Chassis etch and Brass Body etch as shown (from which the boiler is missing). Also includes castings pack - one of the pouches has been opened and the parts are loose - there are no instructions / checklist so cannot confirm if complete or not but a few bits seem to be missing. 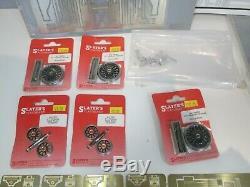 Also includes complete set of Slater's wheels. One for the experienced kit or scratch builder. I have tried to describe what is included to the best of my ability but I only have a limited amount of time I can devote to this so please view all photos carefully to assist with the description. If, for any reason, you are not fully satisfied with your item please DO NOT just leave negative or neutral feedback without first contacting us. There are no issues which cannot be resolved. Please message us with any enquiries. Larger and heavier items will be sent via courier. If you prefer a different service please message us, we are more than happy to meet your requirements although different services may incur additional charges. If you prefer to collect your item in person this can also be arranged from Ripon, North Yorkshire. Please take the time to leave feedback, we pride ourselves on the standard of service we offer. We will always do the same for you. Thanks for your interest, please visit our. For many more Models, Accessories etc. 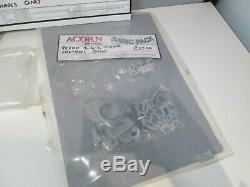 The item "Acorn Models 7mm O Gauge 82xxx (3MT) Tank Locomotive Brass Kit pls read" is in sale since Thursday, March 14, 2019. This item is in the category "Collectables\Model Railways & Trains\O Gauge\Locomotives". 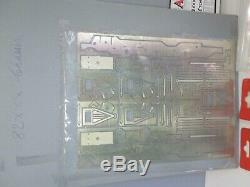 The seller is "the-train-shop-uk" and is located in Ripon. This item can be shipped to United Kingdom, Antigua and barbuda, Austria, Belgium, Bulgaria, Croatia, Cyprus, Czech republic, Denmark, Estonia, Finland, France, Germany, Greece, Hungary, Ireland, Italy, Latvia, Lithuania, Luxembourg, Malta, Netherlands, Poland, Portugal, Romania, Slovakia, Slovenia, Spain, Sweden, Australia, United States, Canada, Japan, New Zealand, China, Israel, Hong Kong, Norway, Indonesia, Malaysia, Mexico, Singapore, South Korea, Switzerland, Taiwan, Thailand, Bangladesh, Belize, Bermuda, Bolivia, Barbados, Brunei darussalam, Cayman islands, Dominica, Egypt, Guernsey, Gibraltar, Guadeloupe, Grenada, French guiana, Iceland, Jersey, Jordan, Cambodia, Saint kitts and nevis, Saint lucia, Liechtenstein, Sri lanka, Macao, Monaco, Maldives, Montserrat, Martinique, Nicaragua, Oman, Pakistan, Paraguay, Reunion, Turks and caicos islands, Aruba, Saudi arabia, United arab emirates, Ukraine, Chile.